For a lighter note I would like to share this album from Congo D.R.. 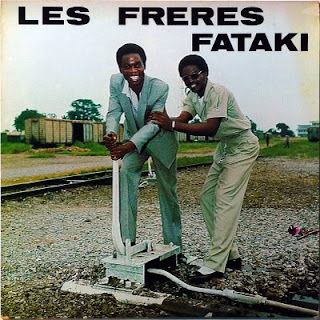 It is by Les Frères Fataki and orchestre "Touche Pas", and -although undated- probably from the late 1970s. The lokolé slit drum, which Papa Wemba is said to have introduced into modern Congolese music (but I have a nasty suspicion this record may have inspired him...), is clearly present in this record. In fact, apart from the vocals one could go as far as to call it the main attraction of this pleasant, but not great lp. On Sunday May 10* Coumba Sidibé has passed away in her home in the Bronx, New York. Coumba Sidibé was certainly one of the pioneers of kamalen n'goni music in Mali, but never got the international recognition for this. A reason for this may have be that she left Mali in the 1990s, and via Abidjan and Paris settled in the US. Musically Coumba's heyday must be sought in the the 1970s and 1980s; first when she was a star with the Ensemble Instrumental National ("Diya Ye Bana", her greatest hit from that period can be heard here), and subsequently after her magnificent performance on Malian television (at the time called RTM) in the mid-1980s, of which I have posted two tracks earlier ("Tolo" and "Noumouna Koulouba"), and of which I am posting the first track here. In this track Coumba is addressing the president, - at that time 'Balla' Moussa Traoré. The second video is from Coumba's stay in France in the 1990s. It shows a very different Coumba Saba, compared to the rather timid, but vocally brilliant artist of the RTM performance. There is an element of 'swagger' in her appearance and she takes her time to receive the praise. Vocally she has lost some of the intensity she had in the RTM video. The track "Yali Djamou" was originally released on the cassette I posted earlier. I am told that one of the two dancers/chorus girls is a daughter of Coumba (but I don't know which one). With the death of Coumba Sidibé Mali loses another of the pioneering stars of the kamalen n'goni music. * Afropop reports it was on May 9. 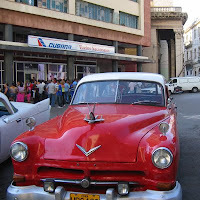 Visiting Cuba as a tourist you may still get the impression that Cuban music is mainly son or cha-cha-cha. Hopping from resort to Casa de la Trova and from Trinidad to Caya Coco, the evolution of Cuban music can go completely unnoticed. But if you're lucky or walk the streets of Havana or any other Cuban city unguided and open your ears, you will hear other sounds. And if you're even luckier it won't be only (Puerto Rican or Cuban) reggaeton. Even today, there is still a chance you'll catch a shred of a timba track by Los Van Van. Los Van Van ("The Go Go's") founded forty years ago (to be precise on December 4, 1969) by Juan Formell, who at the time was a leading member and composer in Elio Revé's Orquesta Revé, have played a crucial role in the evolution of the traditional son into the present-day timba genre. The main players within the orchestra were, besides Juan Formell (left in photo), percussionist/arranger José Luis Quintana a.k.a. Changuito and pianist/composer Cesar 'Pupy' Pedroso (right in photo). Both these great musicians have left Van Van since to go their own way. I have no intention to write down the whole history of this essential Cuban orchestra. Instead I would like to refer you to this interview with Juan Formell from the Cuban newspaper Granma. I first saw Los Van in the mid-1980s, and was very impressed by the tightness of their performance on stage. I was disappointed however by their studio recordings, which seemed rather sterile compared to the dynamics of their live act. When I saw them again in 1988, I remember several 'official' music critics commenting they should make a live recording. The album "Songo", released by Island Records a year later, was an attempt to capture the atmosphere of Van Van live. 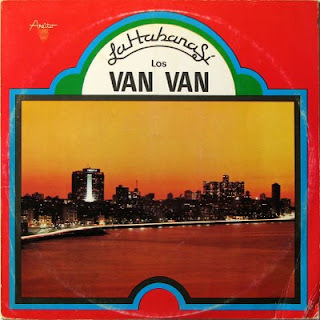 The lp "La Habana Si" is typical of the Van Van sound of the 1980s. It has a polished, modern sound with a focus on 'renovation', while making sure the Cuban reality is reflected in the lyrics (- making sure no one is offended, of course....). It features some classic Van Van tracks, like "La Resolucion", "Y No Me Explico Lo Que Tienes" and, of course, Pupy's great hit "El Buena Gente", which he has refurbished recently with his Los Que Son Son orchestra. EDIT November 8, 2012: I've renewed the links. He is originally from Bendel State (since 1991 Edo State), and one the pioneers of the guitar highlife music in Nigeria. That's about all I can tell you about Paul Ede. I posted one song by this star from the past in an earlier post (track A2). And here are ten more. 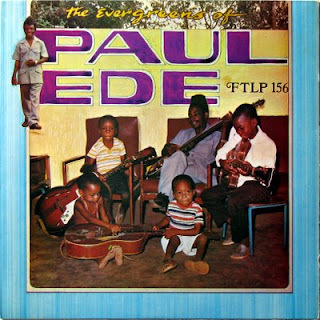 Mr. Ede presents himself on the record sleeve as a family man (although he appears intelligent enough not to let the little ones play with his best guitars...). His music leaves mixed messages: I can imagine myself both in a religious setting, in the comfort of my own home and in a bar, drinking palm wine and surrounded by loose women. Once more, I can't help feeling handicapped by not understanding a word of Yoruba (and I can't even tell you if he is singing in this language). What I really like about Mr. Ede and his group is the casual atmosphere his music creates. But like any art form, when it sounds/looks casual and simple that's when you are dealing with real genius. Paul Ede's casualness too hides decades of experience and an incredible skill. PS: For expertise on Nigerian music I gladly refer you to the Likembe and With Comb & Razor blogs. I'm afraid I am one of those cynics that gets Bueno Vista shivers with every release of yet another 'new' Baobab CD. I mean, like those soneros from Cuba, I really like the music they made when the world wasn't watching, but I can't get the same emotion from their reheated offerings. I don't mean they shouldn't be 'reaping' what they have been 'sowing', - even if this was decades ago. I have been trying to analyse the reasons for my allergy, and - although I am still working at it - I have an idea that it must have something to do with pretension. Or the absence of presumptuousness, the 'unpretentiousness', that appeals to me in those original recordings. Take the tracks on this cassette, for example. Recorded almost casually, and no doubt 'live'. I am sure the musicians in these recordings had no idea they would be 'cult heroes' thirty years later. How else can one croon a song like "Baobab" in hispano-, eh... something? 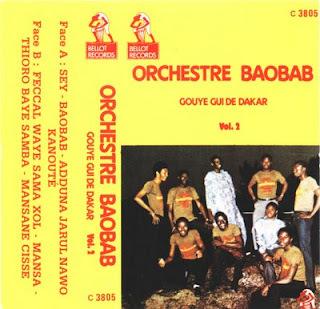 This cassette has it all: from the guitar of Attisso and the sax of Cissokho to the vocal range of Medoune Diallo (mature), Balla Sidibé & Rudy Gomis (harmonic) and teenager Thione Seck. My guess is that these recordings are from the late 1970s. Unlike the later "A Paris" recordings, the focus in this cassette is on versions of Senegalese traditionals. And great versions they are too! PS: If you want more information about the group, there are several biographies available (here's one). This post contains not one, but two of my favourite albums from a Congolese group in East Africa. Started in Kamina (Katanga province, Congo) in 1963 as Rocken Success, through Rocken Band (Lubumbashi, 1964), Super Gaby (Likasi, 1965- 1967), Super Theodore (back in Kamina, 1967) and a few more, the band members in February 1972 voted to become Chimbuiza Chinsense la Maquis du Zaire, which a few months later when they set off for what was supposed to be a tour of East Africa (but from which they never returned) was shortened to Maquis du Zaire. You can read more about the band in Werner Graebner's notes of the "Muziki wa Dansi" CD. And if you want to read more about Congolese bands in East Africa or East African music in general the sites of Alastair Johnston (muzikifan) and Doug Patterson (eastafricanmusic) are essential. To me it is one of the great mysteries of African music that these two albums from 1982 have never been re-released in digital form. These two lps are just bursting with energy and power! Maquis has a turbo rhythm section, great horns and some of the very best Franco-like guitars, especially in "Masua", "Bondela Moninga", and in that killer track "Sérieux Ya Mukoko". Unfortunately I don't have copies of the sleeves. So I am borrowing this picture of a single from the same "Edition Omaco" record label. EDIT: Cheeku has provided us with a copy of the sleeve of one of the two lp's (originally from Matt at Matsuli's - who by the way has posted some great east african 45s). Here is the front and here the back. And thanks David from Ambiance Congo for a copy of the same sleeve! 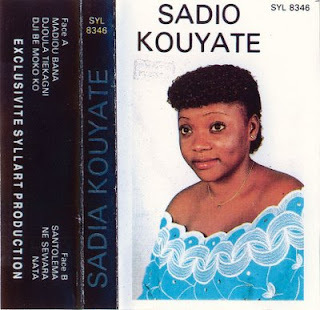 Sadio Kouyaté was born in Segou (Mali) into a family of griots, and started singing at the age of 7 under the guidance of her grandmother, Penda Danté, who herself was a legendary singer and known as "la djeli de Ségou". With her grandmother she started singing locally, at baptismal ceremonies. In 1984 she went abroad for the first time, to Abidjan and later to Lomé. She went to France in 1989 and decided to stay, making frequent trips to the US and other countries. This cassette is from her days in Mali, when she was a force to be reckoned with. It contains six superb songs, sung with great passion and conviction. Personal favourites are "Santolema" and the world-class "Nata".